The M.A.C Snow Ball collection is AMAZING! I wish I was privy to the launch sooner, cause many items sold out before I had the chance to splurge. The collection is winter themed, sparkly and festive. This Christmas I put the Here Comes Joy Face Powder in my stocking - yes, I filled my stocking with amazing gifts. 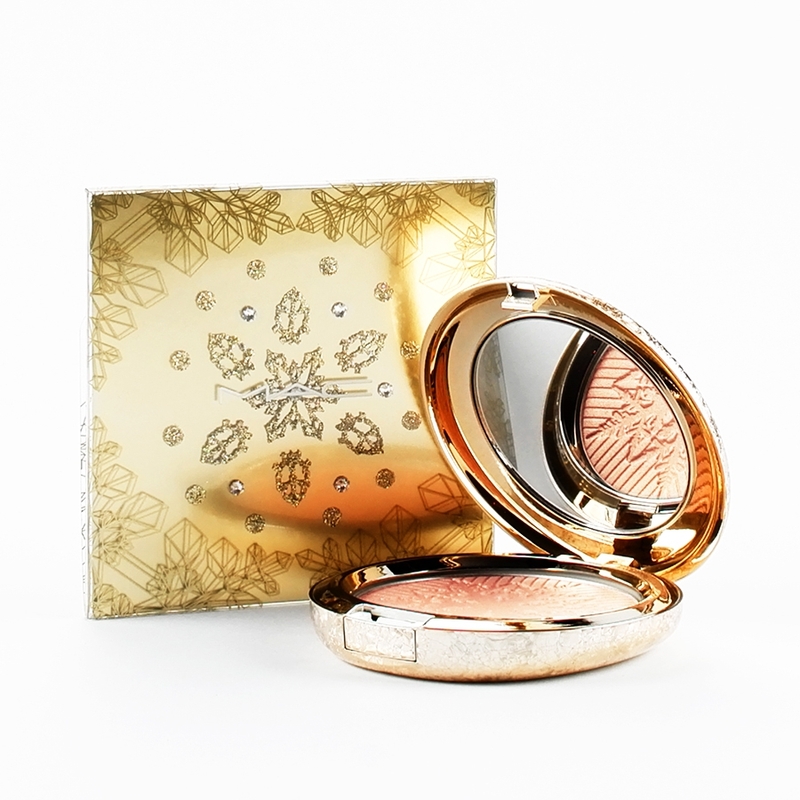 The high-impact shimmer highlights your face and illuminates your complexion. Apply to your cheek bones, brighten your eyes and create a luminescent finish on your décolletage. I love the Festive Bling! crystal and glitter festive adornment. It's the perfect accessory for a sparkly event. You can apply the adornment as shown or use individual pieces for a custom look. This face or body bling is unique and fun. The crystal and glitter snowflake adornment can be reworn - just gently remove from your skin and place back on the card till your next 'sparkly event'. I'm a makeup brush addict. Especially, travel makeup brushes. Every year I purchase a Bobbi Brown brush set, but this year I went with M.A.C Cosmetics brush sets. I'm kinda in a M.A.C mood these days.. During the holidays M.A.C Cosmetics releases a themed collection. Last year the theme was the Nutcracker. I love the cosmetic bags from last years collection. This past holiday season was the Snow Ball collection. A winter themed collection with sparkles, sparkles, sparkles.. I don't really need all three makeup brush sets - I don't 'need' any makeup brushes! But each set had something I wanted, so I purchased all of them. I'm beyond happy with the quality of these brushes. The bristles are super soft and the glitter-embellished handles add a little sparkle to my cosmetic/travel bag. I especially like the brow groomer - the brush is big and the bristles are soft. It's a great brush for taming your brows. The silver brush set contains your basic brushes - powder, pointed foundation, all-over shadow, smudging liner and brow groomer. The gold brush set includes an angled powder, angled foundation, angled large shadow, angled small shadow and pointed liner brush. The little rose gold set (my favorite color and bag) has three brushes - a powder, large shadow and small angled brush. Each brush set comes with a sparkly cosmetic bag. They each have a fluffy pompom (love that). 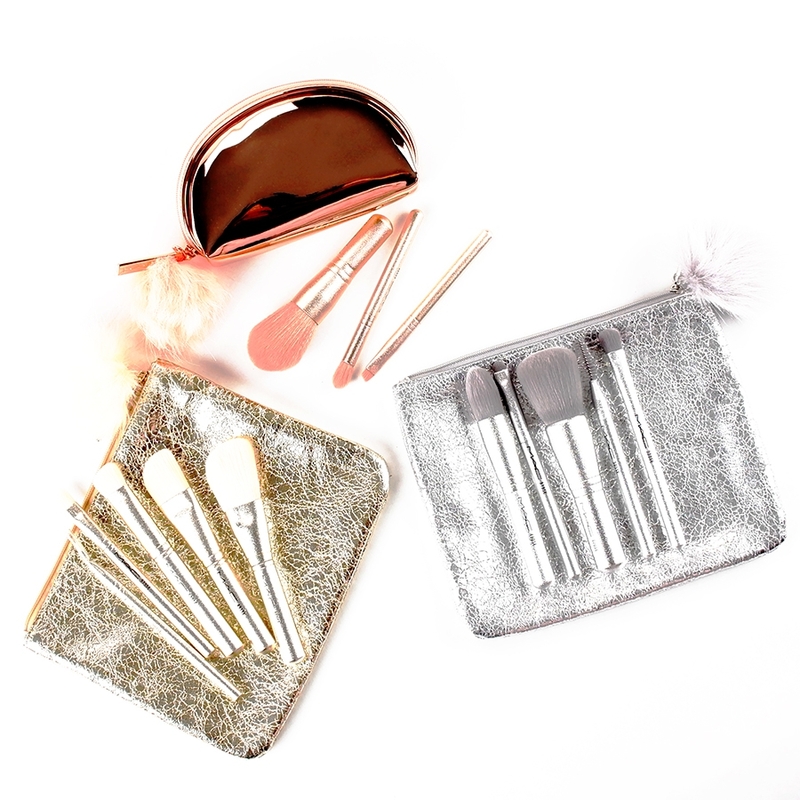 The silver and gold makeup brush sets are in the 'goodbyes' section online, so they're on sale and will soon be out of stock. These makeup brush sets would be a great Valentines Day gift..